This post examines changes in the ethnic and racial compositions of kindergarten through twelfth grade schools in New York State metropolitan areas over the past 25 years. During that period, the student population, like the general population has become more diverse, with the percentage of students identified as white decreasing, while minority group members, particularly Hispanics, have become a larger proportion of the total population. But, has the increased diversity of the overall student population been reflected in individual schools? The data show that although New York’s metropolitan regions are more diverse than they were in the past, the gap in racial and ethnic composition in our schools is larger. Between 1990 and 2015, the percentage of the national population that identified itself as white decreased from more than 75% to 62%, while Hispanics increased from 9% to 17%. The number of people who identified as Asian increased from 2.8% to 5.1%. (Source: U.S. Census Bureau, 2011-2015 American Community Survey 5-Year Estimates, 1990 Decennial Census.) Upstate metropolitan areas are much less diverse than the nation as a whole. Smaller metropolitan areas had very small minority group populations – the Binghamton metropolitan area was 87% white in 2015, while the Utica area was 86% white. Larger upstate metropolitan areas were also less diverse than the nation in 2015. Buffalo was 78.5% white, while Rochester was 77.4% white. In contrast, in the New York City metropolitan area, white residents were less than half of the population – 44.4% – while Hispanics were nearly one-quarter of the total. The kindergarten through grade twelve population has shown a greater demographic shift than the population as a whole at the national level between the 1990-1991 school year and 2014-2015. The percentage of students who identified as white decreased by 17.3%, from 69.4% to 52.1%. The Hispanic population increased by 13.1%, while the percentage of students identified as Asian increased from 3.2% to 5.1%. Source: National Center for Educational Statistics – Elementary and Secondary Information System. Compared to the nearly even split between white and minority group students nationally, upstate metropolitan areas are relatively less diverse – particularly smaller metropolitan areas, like Binghamton, Utica and Syracuse. But even these areas have seen significant increases in the percentage of students who are black, Hispanic and Asian since 1990. Small metropolitan areas, like Binghamton and Utica-Rome, were about 80% white in 2014-2015, and had black and hispanic populations that each comprised less than 10% of the total. In 1990-1991, these metropolitan areas were more than 90% white. Medium sized metropolitan areas had k-12 student populations that were between 65% (Buffalo) and 75% (Syracuse) white in 2014-2015. In 1990-91 the percentage of white students was 15% to 20% higher in each of these metropolitan areas. In these metropolitan areas, the percentage of students who identified as black and Hispanic increased by about 10%. In New York City, in 1990-91, the school population was 18.9% white in 1990-91, 37.6% black and 34.5% Hispanic. By 2014-15 the white population had decreased to 15.5% of the total, while the black population decreased to 25.1%. The Hispanic population in New York schools increased to 40.9%, while the Asian population grew from 7.8% to 18.1%. Suburban areas around New York City on Long Island, and Westchester, Orange and Rockland Counties had large decreases in the percentage of white students in school populations – more than 20%. These areas saw large increases in Hispanic students, who increased by 15% to 17% as a percentage of school populations. In the next section, I look at the question of whether the increased ethnic and racial diversity of student populations in metropolitan areas is associated with decreased racial and ethnic segregation in schools. This section compares the racial and ethnic composition of schools attended by typical black and Hispanic students with those attended by white students in 1990 and 2015. It does so by finding the percentage of black/Hispanic students at a school for a median student in each racial/ethnic group. Computing the median involves sorting all the students in a group (black/Hispanic or white) in a metropolitan area by the percentage of minority students in the schools that they attend, and finding the percentage of black/Hispanic students in the school attended by a student who is at the exact middle of the sort. Half of the white or Hispanic/black students would be attending schools with an equal or higher percentage of Hispanic/black students, while half would have an equal or lower percentage. The difference between the percentage of minority students in schools attended by typical white students compared to typical black/Hispanic students increased between 1990-1991 and 2014-2015, with one exception (New York City). Despite the increase of Hispanic and black students from less than 10% (18% in Rochester) to between 20% and 30% of the student population in upstate metropolitan areas, typical white students attend schools with Hispanic/black populations that make up about 5% of the total. In contrast, black and hispanic students typically attended schools in 2015 where black and Hispanic students make up more than 50% of the population. Also of concern is the fact that the racial/ethnic gap between schools that typical white and Hispanic/black students attend increased between 1990-1991 and 2014-2015. In the Albany-Schenectady-Troy metropolitan area, in 1990-1991, typical white students would have attended schools with 2% black and Hispanic students. Typical black and Hispanic students attended schools with 38% black students in that year. In 2014-2015 typical white students attended schools with 5.8% black/Hispanic students, while typical black and Hispanic students attended schools with 55% black/Hispanic students. The gap between the schools attended by typical white and typical black/Hispanic students increased from 36% to 49%. In Nassau and Suffolk Counties in 1990-1991, typical white students attended schools at which black and Hispanic students made up 5.8% of the population. In 1990-91, black and Hispanic students attended schools which were 50% black/Hispanic. The racial/ethnic gap increased by 6.1%. In Westchester, Orange and Rockland Counties, in 1980-81, typical white students attended schools that were 7.1% black/Hispanic, while typical black/Hispanic students attended schools that were 49.9% black/Hispanic. In 2014-2015, in those counties, typical white students attended schools that were 19.4% black/Hispanic, while typical black/Hispanic students attended schools that were 71.6% black/Hispanic. The racial/ethnic gap in Westchester, Orange and Rockland counties increased by 9.4%. New York City differed from other locations in New York state in that the differences in the racial/ethnic composition of schools attended by white students and black/Hispanic students has stayed constant at about 60% in 1990-91 and 2014-15. Although our nation is often characterized as a melting pot that has absorbed many ethnicities and races, black/Hispanic students increasingly attend schools that are primarily black/Hispanic, while white students continue to attend schools that are overwhelmingly white. Over the period between 1990-1991 and 2014-15, the gap between the schools typically attended by whites and those attended by blacks and Hispanics increased – in schools attended by median black and Hispanic students, the percentage of black and Hispanic students increased more than it did in schools attended by median white students. This is important because black and Hispanic residents and whites have relatively little interaction in their neighborhoods, and in the schools that their children attend. Cities and the schools within them continue to see large decreases in white populations. City minority populations are stable or increasing, while suburban communities remain overwhelmingly white. Housing segregation is reinforced by the fact that average incomes of blacks and Hispanics are substantially lower than white residents, so that relatively high suburban housing costs are a barrier to suburban housing choices. Economic and residential separation is strongly rooted in New York and the United States. Causes include discriminatory government housing policies and non-governmental practices that denied black people access to home ownership in the growing suburbs of the post-World War II era, historically lower average levels of minority educational attainment, and lower black and Hispanic incomes at the same levels of educational attainment as whites. The concentration of minority students in schools with high percentages of minority students has negative consequences for minority students, largely because these schools typically have high concentrations of low-income students. Economically disadvantaged students who attend schools with relatively few disadvantaged students do better on evaluations of student performance than those who attend schools with high concentrations of disadvantaged students (see this, and this). The fact that black and hispanic students increasingly attend schools with high concentrations of minority students should be of concern. 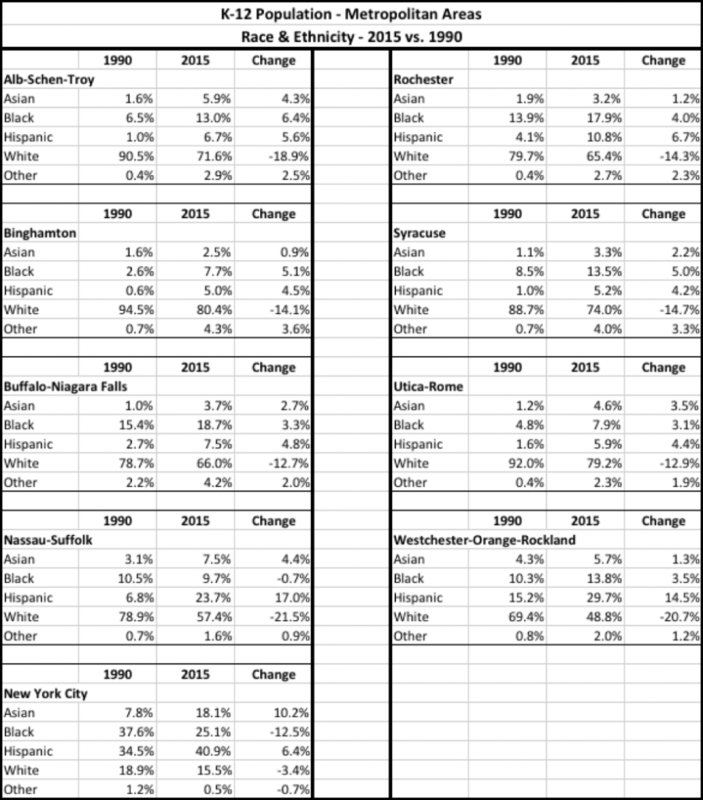 My next post will compare changes in minority and white student populations in cities and suburbs in New York state.